Chaudhry Abdul Jalil (Urdu: چوہدری عبدالجلیل) aka Chacha Cricket (Urdu: چاچا کرکٹ) is one of Pakistan’s most ardent and famous cricket mascots and fans. “Chacha Cricket” literally means “Uncle Cricket”. He was born in Daska, Punjab on October 8, 1949 close to Sialkot, north-west Pakistan, and watched his first international match on the Colin Cowdrey tour of 1969. Whatever time he could get away from his job in the forestry department in the United Arab Emirates would be spent either playing or watching the game. He started to be recognised by other Pakistan fans and a cult soon developed around his patriotic slogans. Then, in 1997, he was taken by the idea of having an outfit made for him in Pakistan’s colours. In the 1980s, Jalil used to work in Abu Dhabi, United Arab Emirates. 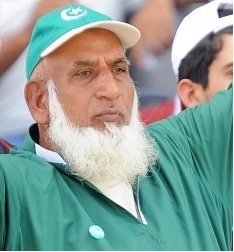 He later resigned from his job and began to follow the Pakistan national team around the world on a full-time basis. As his fame increased, the Pakistan Cricket Board hired him and currently sponsor him to travel around the world following the Pakistan team. yup i used to see him supporting Pakistan in Sharjah. A very patriotic person and a lovely guy.